I'm into gingerbread in a big way this season, and that's not always been the case in previous years. I'm not sure why. Perhaps because I was too busy stuffing Oreos inside Red Velvet Crinkles, or building the biggest Black Forest Cake ever, ever, ever. But this year is different and I just can't get enough ginger-spiced goodness! There's just a touch of cream cheese added to the frosting - not enough to call it cream cheese frosting, but just enough to give it a tang. It's a nice complement to the spiced cake. I gave the frosting a candy stripe with red and green gel food color painted on the inside of the piping bag. I think next time I make these, I'll add a little peppermint extract so the flavor matches the appearance. for the candy stripe effect. Piping tip is Ateco 847. 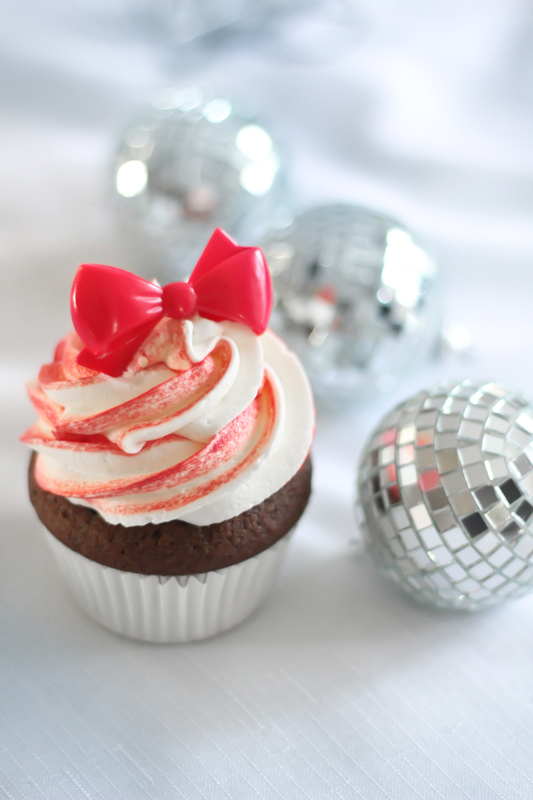 You may remember seeing some similar bow-topped cupcakes earlier this year. 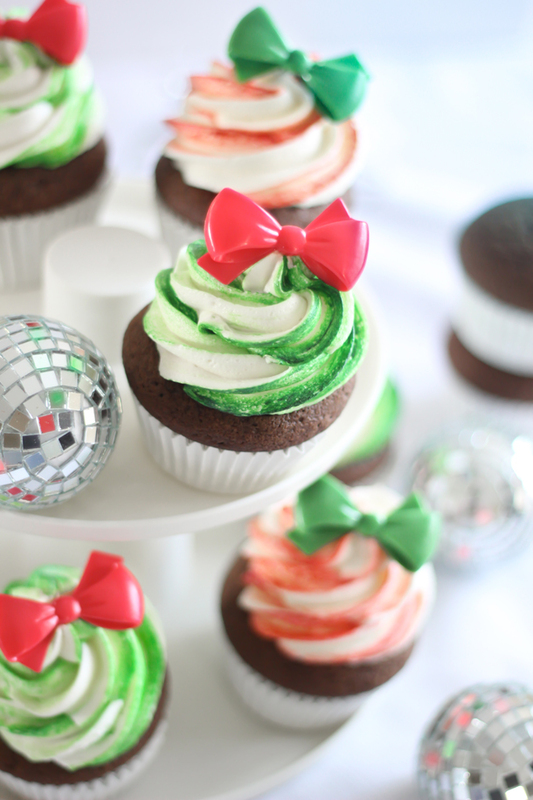 I just love how they make cupcakes look like a present (for me?!) You can purchase them here. In large bowl, beat granulated sugar, 1/2 cup butter, the molasses and eggs with electric mixer on medium speed, or mix with spoon. Stir in flour, baking soda, salt, ginger, 1/2 teaspoon cinnamon, the allspice and water. Spoon about 1/4 cup batter into each muffin cup. Bake 350F/180C for 15 to 18 minutes or until toothpick inserted in center comes out clean. Cool 5 minutes; remove from pans to cooling racks. Cool completely, about 20 minutes. In a stand mixer fitted with the whisk attachment, mix together the butter and confectioners sugar. Begin on low speed until crumbly, and then increase to high and beat for 3 minutes. Add the cream cheese a little at a time. Add vanilla extract and beat again until light and fluffy. If you find the buttercream is too stiff, you may add milk or heavy cream 1 tablespoon at a time until the mixture is piping consistency. Fit a piping bag with a large closed star decorator tip (Ateco 847). Dip a small artists’ brush in the red or green food color and paint 4 well-spaced stripes onto the inside of the piping tip and all the way up the piping bag. Carefully spoon the frosting into the piping bag and pipe swirling mounds of icing (about 3 passes) on top of the cooled cupcakes. 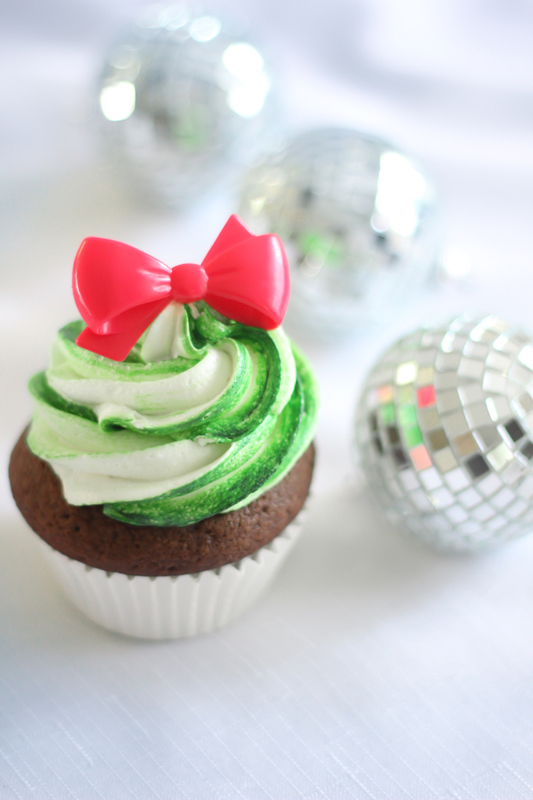 Garnish with a bow cupcake topper, if desired. So very festive and adorable with the tiny bow! I have to try that technique next time I make a batch of cupcakes. Thanks for the inspiration Heather! Love the touch of cream cheese in the frosting! Perfecto for Gingerbread! 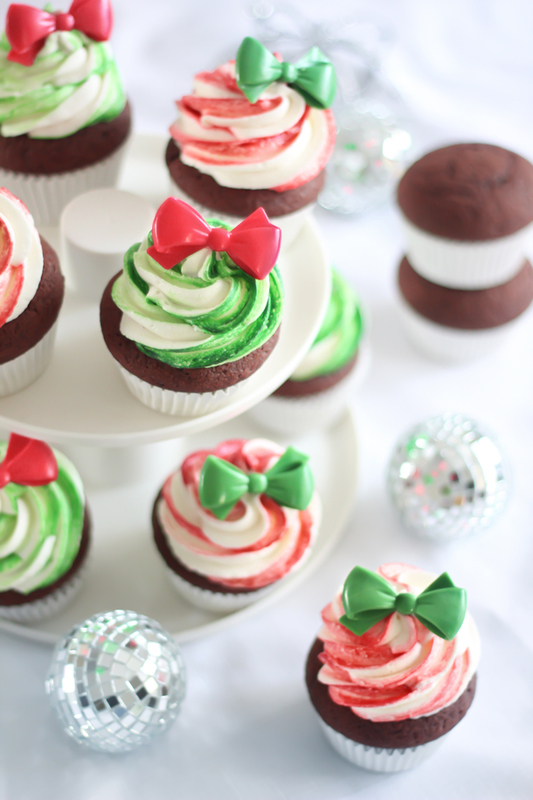 Bows, stripes, its official, these are the cutest cupcakes ever! Where is the number 9? Hi Heather - about to bake these cupcakes to get in the festive spirit but note that you don't mention oven temperature? I am going to guess 180 degrees - Merry Christmas! Hi Anonymous! Oops! Yes - 180C/350F Thank you for mentioning - I'll make the necessary corrections!